When the chilly cold winters arrive, we gear up our homes for the freezing nights and cold days by prepping our heating systems. Keeping a house warm in the winter season is no ordinary task! Unfortunately, they require a huge amount of power consumption, thus increasing the running costs. We all want to remain warm and comfortable in our homes, but finding affordable ways of keeping a house warm depends on a number of factors. Understanding these factors could help you take better decisions for warming your home and not cost you too many bucks! This article will help you understand what factors could affect the home temperature and how you can use your thermostats and room heaters to maintain comfortable temperatures at home. We will also give you some ideas on how you can reduce your home heating and cooling bills so that you can have a happy warm winter time. Having a hot cup of cappuccino might make you feel warm but you have to take bigger measures if you want to last the winter. There are a few underlying issues that you need to take care of, for a warm and cozy home. The average house temperature in winter depends on three main factors. Ducts are running all around your home and during the winter, your house may not warm up if there are faulty duct lines. The ducts need to be insulated and sealed, so check for any leaks. If there are leaks, air from outside will leak into the insides of your home and not allow proper heating. This could cost you an unreasonable amount of extra cash when it comes to paying utility bills. Consult an HVAC specialist who can help with sealing the ducts. You also need to check if there are any blockages which could be affecting the airflow around the house. In the end, just ask a renovator for some modifications to improve the warm air circulation in every room. You can sometimes have blocked drain lines. The blocks are usually made of sediment, mold, fungi and algae which could cause the furnace to not work properly. It could ultimately stop working, so it’s best to look for drainage blocks. Same goes for air conditioners. Check to see if the condensate pan in the AC unit is filled with too much water. This obviously means the drain line is clogged and dirty. You could clean it out yourself. Take a mixture of water and bleach and rush it down the drain pipe. Wait for a few minutes and then run water down to clean it up. You could ask an HVAC professional to do this as well. You could have a lot of dust and dirt over the air filters, which could make the furnace inefficient. Because of this, the furnace may not last for long. So, your home will not warm up properly. Replace the filters whenever possible, especially if you have pets or allergic people living in your household. How to Save Your Energy Bills? In winter, keeping homes warm and running a heating system for a long time can be quite expensive. A few regular habits and routine checkups can help you avoid unnecessary costs. If your house is bigger, you should close the doors of rooms not in use. Also, close doors every time you walk in and out of a room. This will allow easier warm up. Run diagnostic tests on all the components of cooling and heating systems, such as furnace, heaters and air conditioners. Check if the thermostats are showing accurate temperatures. By inspecting all equipment, you can detect problems earlier before winter and have them solved in no time. Check the surfaces around doors and windows. You could feel the air flow around these areas. If that’s the case, then consider weatherproofing. You might have to add or replace caulk and change the weatherstripping. These products undergo wear and tear over time, which is why replacing is essential. During the day, keep the curtains open and allow sunlight to enter all corners of your home. Even if you leave your home, keep the curtains open. By allowing sunlight to warm your home during the day you can save so much money by temporarily disabling the heating systems until dark. At night close the curtains to prevent the warmth inside your home from escaping outside. The curtains sort of act like insulations. You could put up sheets over doors or windows on the outside temporarily. This is the best way to heat a house and keep rooms warm in my opinion. When your furnace fire is on, use a glass front so that some heated air is prevented from escaping through the chimney, even after the flames are no more there. Keep the furnace flue closed when the furnace isn’t being used. This will prevent cold air from getting in. By following these few simple tips, the room heaters would be able to warm up your homes quicker, and maintain the warmth for a longer period of time. 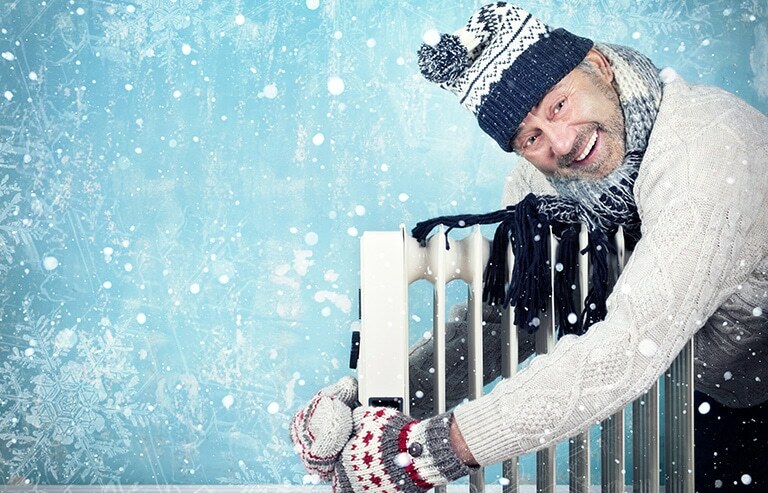 What’s the Best Temperature for Heater in Winter? Did you know, that for every degree of temperature you reduce in your thermostat, your energy bill lowers by 1%? So does this mean that you’ll have to keep the thermostat temperatures low at all times? Well, not really. Experts suggest that the best temperature for heater in winter is 68 degrees F, if you want to ensure that your bills are lower and your use of energy is more efficient. If you still feel cold then opt for wearing winter clothes to make you feel warmer. Follow the tips that I have provided earlier and your home won’t feel so cold. The U.S Department of Energy also suggests keeping the home temperature at 68 degrees F constant. You could set it a bit lower when you go to sleep. Since utility bills depend mostly on the heating and cooling cycles, a few adjustments here and there could really make a difference. Select any time of the year and consider doing an energy audit at your place. This way you can make any necessary changes before winter arrives and set up comfortable temperatures. You could do energy audits yourself but it’s better to let the experts handle it, who can easily spot problems and suggest what to do next. Based on your budget you get to make the changes. This way you get to manage and save your energy bills better. Such routine maintenance processes can reduce costs a lot, considering that an average American spends around a thousand dollars behind heating costs per year. Despite the cold weather, winters are a time of enjoyment and fun. Ski trips, Christmas parties, Thanksgiving and snowball fighting! The most important thing is to keep yourself warm. After all, you are keeping your home warm to keep yourself and your family members warm. Wear warm winter clothing and try to save as much utility costs as possible, to have a worry-free, cozy winter.